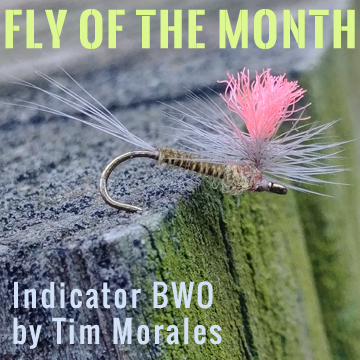 The Indicator BWO is essentially a standard parachute dry fly. The important difference is that the post is fluorescent making it much easier to see. This fly can also be used as an indicator on a nymphing rig, giving the angler the ability to fish both the adult stage and ascending nymphal stage at the same time. This entry was posted in Fly of the Month, The Art of Fly Tying and tagged dry flies, fly fishing, fly of the month, fly tying instructions, fly tying materials, fly tying recipe, fly tying tips on May 30, 2017 by Tim Morales. 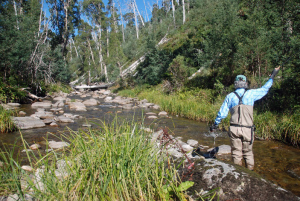 This entry was posted in Favorite Fly Fishing Spots, Fly Fishing Life, Mike Cline, Bozeman MT and tagged fly fishing, fly fishing life, trout fishing on May 26, 2017 by Mike Cline. This entry was posted in Mike Cline, Bozeman MT and tagged flies, fly fishing, Tasmania fly fishing, trout fishing on May 25, 2017 by Mike Cline.